Sensor for measuring force, such as push, pull, etc. 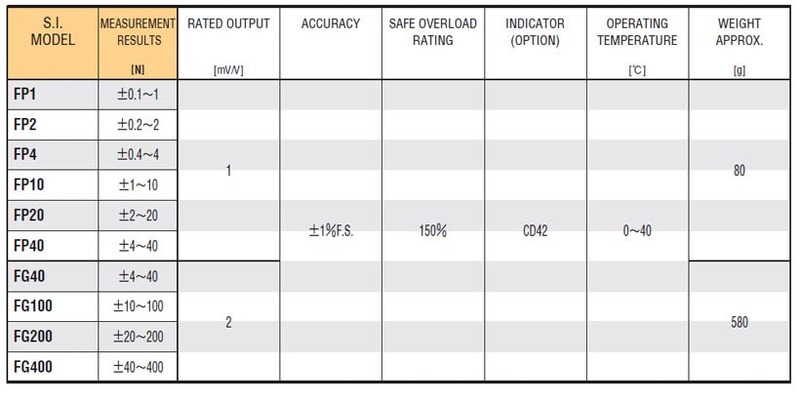 By combining with digital display separately, FP/FG sensors eliminates disadvantages of the conventional sensors, such as "heavy", "not portable" and "difficult handling". Combined with digital display (CD42) which is sold separately, push and pull force can easily be measured, such as key board, switch, etc. FP/FG models are available from 0.1N to 400N. FP model is pen type and FG model is grip type. 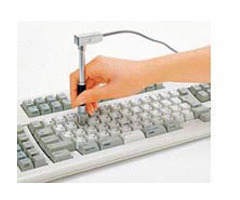 If the sensors are used with the sensor stand model FS500 (optional accessory), more accurate force can be measured. Data can be downloaded to PC or printer with the output of the digital display. Stand attachement is supplied as standard accessory. Please order the force sensor together with the digital display CD42. If the sensor is only ordered, please inform of the specifications of digital display to be used. If the sensor is used in the system, please contact Tohnichi sales office for assistance.